Teaching is popular. Maths even more so. Last night was the school year's official opening at Hogeschool Utrecht. Around 17:00 all aspiring tweedegraads teachers gathered in the cafeteria for a speech from the rector. It was interesting to see that the group was both large and varied. I reckon there were about a hundred people there, maybe one-twenty. Aged between twenty and somewhere in their fifties I saw a lot of caucasians, mixed in with a few turks and moroccans. One startling realization was the fact that almost 50% of the group were there for the same degree I was after: tweedegraads maths teacher. I guess either it's a popular passtime, or people have caught on to the fact that maths teachers are sought after. All in all there's sixty people starting the maths course this year. Wow! Yes. This is going to be an interesting year! 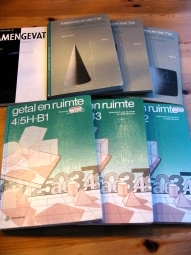 Recently I discovered that the Netherlands' largest online bookstore Bol deals in secondhand books. Or more precisely: it works as an intermediary between seller and buyer. I guess you could compare it to the Amazon Marketplace. Study books are notoriously expensive, often ranging between forty and a hundred euros a piece. Of course I wasn't looking forward to paying such a huge sum now that I'm starting college. Lo and behold! Bol's secondhand section listed six out of the eight books I need for the first semester. By buying these books I managed to save seventy euros, bringing the total down to a little over two hundred. Nice! 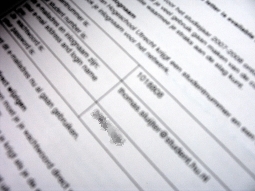 Another nice way of saving a few bucks is the fact that Hogeschool Utrecht allows spread payment of my fees. This year's college fee is about a thousand euros, give or take a few. Instead of paying this whole sum up front, I can now pay in six terms. Even better, these terms are spread all over the whole year. This means that we can easily save up a little money and still have ample breathing room. It'll be a grand year! There you have it: my school roster for this year. It may be a bit hard to read the first time around, but let me break it down for you. The table shows all courses for both the first and second years of my study (english math teacher). All course are given on Monday and the appropriate times are shown on the left. The four columns to the right indicate each semester: there's four in a year and most courses are only given once a year. * Statistiek 1. I'll need to study both the math and the didactics behind statistics and the calculation of changes. * SLB. This roughly translates as Study career guidance. We'll discuss my progress, the school itself, the materials. It's a bit of a meta-course. * Vakdidactiek 2. A second year project on didactics and the interaction with students. I'll need to find out whether I can take this in the first semester without any big problems. * Analyse 1. I can skip the math behind analytical math (differentials, integrals, logarithms), but I'll need to study the didactics. * SLB. The same as the first semester. * WER. Preparing for my internships, later in the year. * Kijk op leerlingen. A project on the psychology and behaviour of students. Damn. I should've seen this coming. I just phoned the IBG to check up on my college application. The school coordinator'd told me that my application would come through in time, but I decided to check up on it anyway. Nope. No sign of any application or registration yet. Apparently they take three to four weeks to process. Ugh! Now I'm going to have to make arrangements with school to either study there unregistered, or to do some other red-tape trickery. It'll work itself out, but it still feels a little stressful. Since school starts in about three weeks I thought it was about damn time to start getting prepared! It's one thing to make all arrangements with the school, taking care of paperwork and talking to people. But it's another thing entirely to actually be prepared for the course material! I graduated from college a little over seven years ago. For about half of my college years I was very busy with maths, learning all kinds of new tricks. All the other time was spent programming, doing web design and learning about Unix. Since my career progressed with the latter half of what I just described, it's only natural for my maths to be a little rusty. Well, rusty would be an understatement. Consider if you will one of the original, iron nails that Noah had used in his arc. Having been exposed to tremendous amounts of sea water and ages upon ages of time it's sure to be a bit rusty. Now, let's assume that ever since that flood the nail had been exposed to corrosives, acid rain and various other nasties. Not much would be left of it, right? A nasty, little chunk of iron would be all that's left. Well, that's where my current grasp of maths is. Thankfully I am confident that I can at least completely revive my high school math skills, considering this blog post. Back in 2005 I prepped Marlijne for an exam that consisted of all my HS maths in only a few hours. The picture above shows all of the books that I want to go through before school starts. The bottom row (plus the b/w book at the top left) are all high school books from my final two years. They cover everything from functions and equations, through trigonometry, to differentials and logarithms. The top row is the stuff I went through in college. It's also the stuff that currently gives me a dread feeling in my stomach because it is way beyond me. They start out by repeating a little bit of HS stuff (differentials, functions), but then quickly move on to limits, logarithms, partial differentials, integrals, multiple variable equations and vectors. Zounds! I won't even mention the two other books that cover Laplace transforms and Fourier strains. Although I doubt whether I'll need to know any of that stuff. Well! Here I go! Study study study! 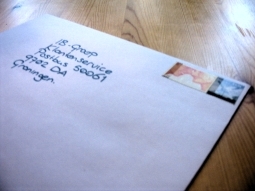 Well, now there's absolutely no way back: I've sent in my application form for the local college. Hopefully I'll receive more information in a few days time. I have to say that I rather dislike the application process though. In the Netherlands, there's one big organisation that handles 99% of the college and uni applications: Informatie Beheer Groep. They also take care of all student loans and grants and the resulting debts. As they are a governmental organisation, they allow one to log in using one's national DigID. This DigID is tied to one's social security number and allows one to get a lot of stuff done through the web. Thus one will not have to fill out endless forms, or to wait for hours at city hall. I thought we were getting that DigID (which includes SMS verificatin) to sign crap like this?